Through pregnancy and post-partum our bodies go through massive changes in size and shape, unfamiliar redistributions of weight, and are constantly changing. These changes can be disorienting and can cause even the most self-confident of women to feel alien in her body. Hormonal surges can make your mind feel alien too. 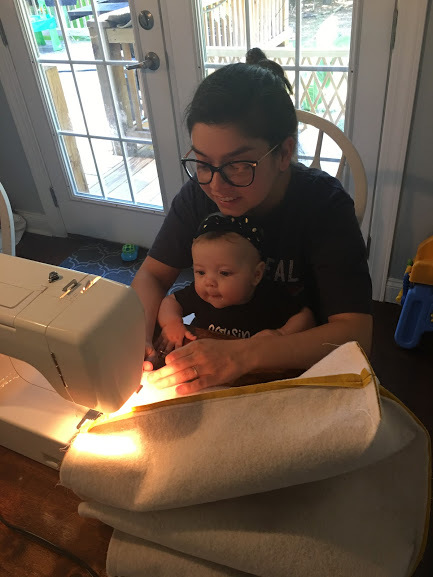 Today on the Maternity Sewing blog we have Jordan here talk about how sewing prepared her for motherhood, through all of these changes and challenges. When my husband and I started talking about becoming parents, I was a little wary. In the years leading to these discussions, I had worked really hard to gain a better understanding of myself. I’d worked through some tough seasons (and several therapists). I’d unpeeled several layers – as uncomfortable as that was – to find a place of contentment. I had found a place of comfort (and confidence) in my professional career. I had also discovered sewing – a creative outlet that became my personal retreat and self-care practice. 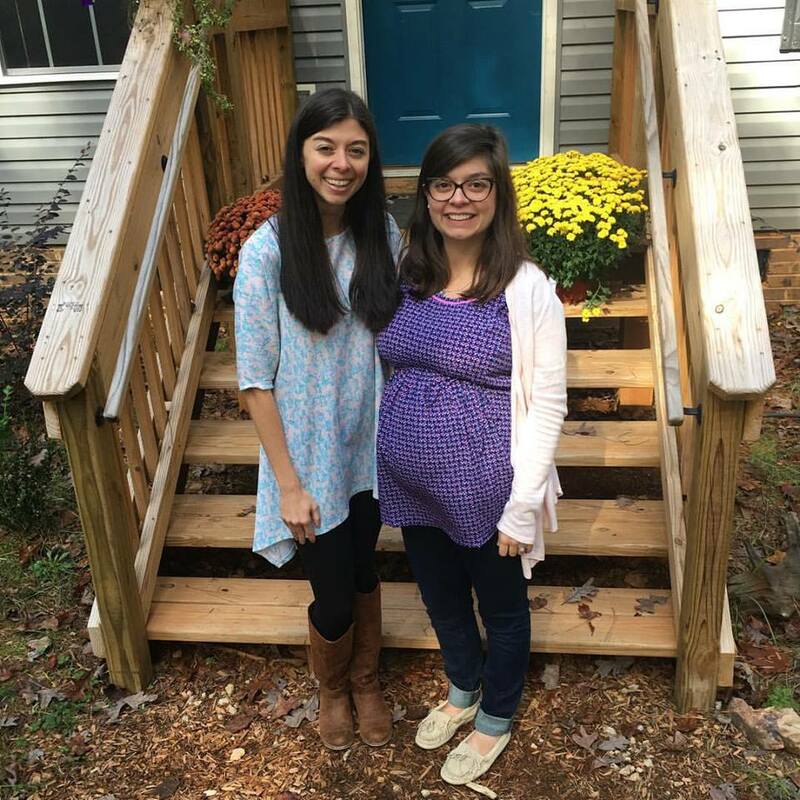 This is a photo of my sister and I at the baby shower she hosted for me when I was around 7 months pregnant. 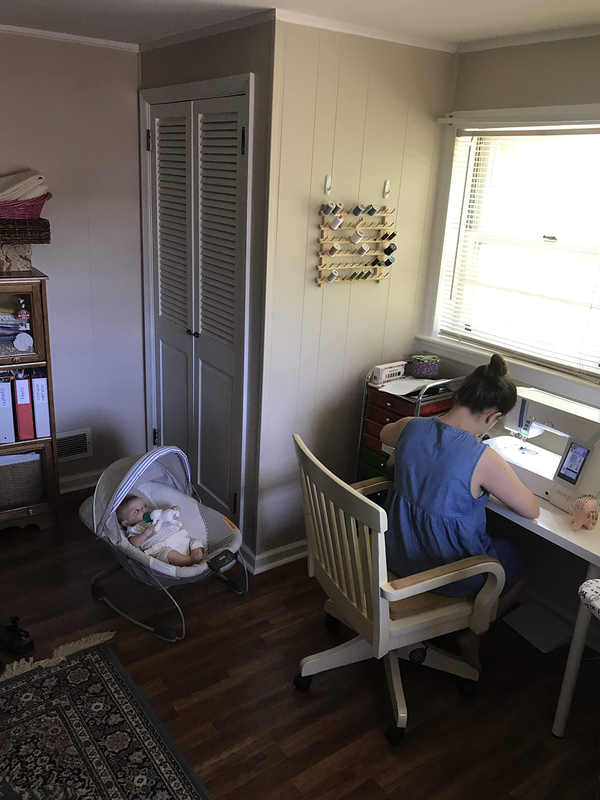 Part of me was afraid that embarking on the journey of parenthood would consume any and all “me time.” I was afraid I would no longer have time to feed my passions – like sewing. From the years prior, I knew I needed this self-care practice if I wanted to continue to be the best version of myself. 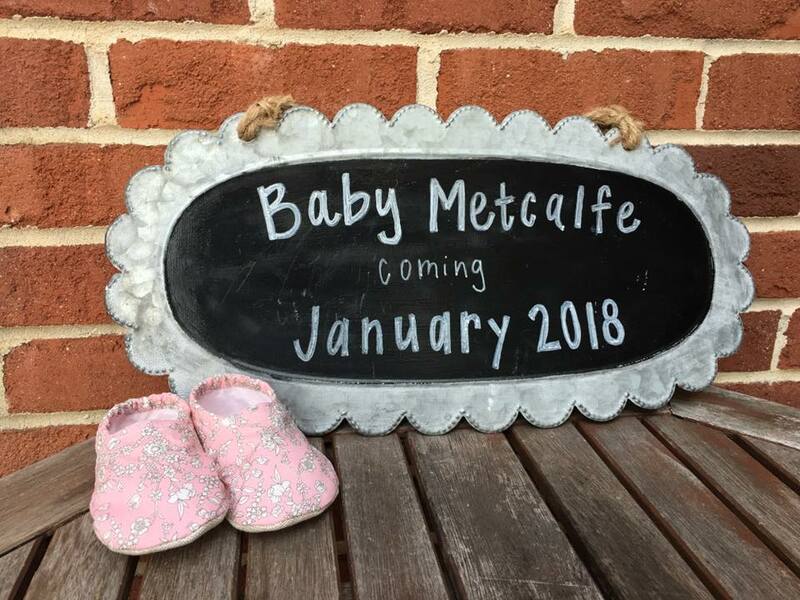 By sharing these worries with my husband, we were able to work together to come up with plans around protecting practices that had become our self-care (because Dads need this too!). Pregnancy really zapped my energy and I found myself much less motivated to sew for my rapidly changing body. I’m not one to rush my sewing endeavors so I knew I would not be able to get proper use out of anything I made anyway. However, I did make a few things for the baby (like the shoes we used in our announcement post). It took me weeks to finish sewing these baby booties. I made them with a favorite Liberty of London print I’d been saving after we found out we were having a girl. Pregnancy was also an emotionally stressful time. 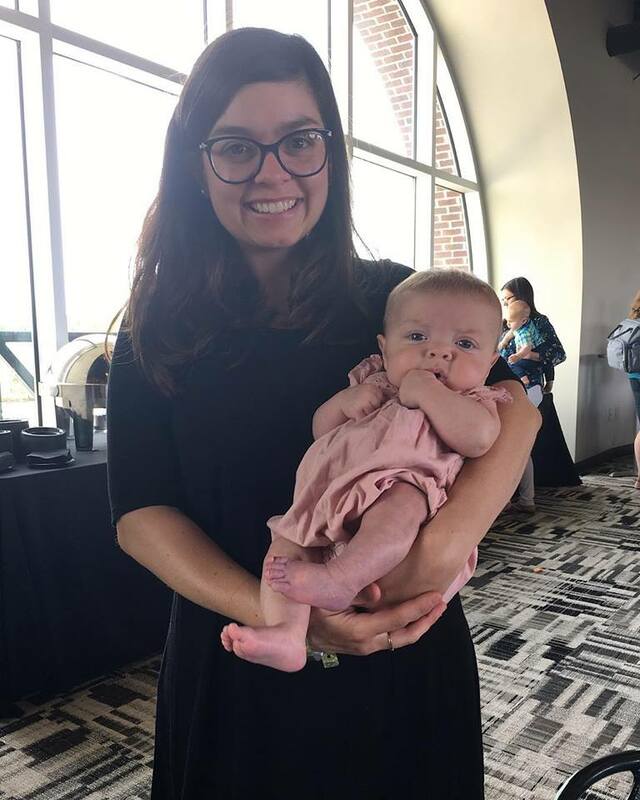 Our daughter has a genetic syndrome which we found out about during pregnancy (you can read more about that in this post). My emotions were on a rollercoaster. I turned to sewing in small doses when I needed to decompress. Having this safe place to retreat allowed me to process my emotions and “refuel” (as an introvert, I process things very heavily internally). Keeping my hands busy with the process of making prevented me from being entirely alone with my thoughts. During particularly anxious times, I find sewing as the perfect balance: Working on a project involves a balance of mental focus (interpreting a pattern and/or instructions) that can act as a distraction as well as repetitive tasks (cutting pattern pieces, pinning fabric, sewing a seam, etc.) that can offer a place for thoughts to flow more freely. Not only does sewing allow me a place to express myself creatively, it also provides the space I need to process my emotions. This is a photo of me working on one of my first postpartum sewing projects: The Parkside Shorts. Andy was almost 5-months-old here. Much of my anxiety throughout pregnancy was related to the high miscarriage rate of babies with Turner syndrome (a condition our daughter has). Once Andy arrived, I felt like I was able to breathe again. Slowly my sewjo returned. When family would stop by to visit, I’d happily hand Andy over for snuggles. With my arms free, I’d wander over to my sewing machine to steal a little slice of time for myself. The first few weeks of parenthood are incredibly hard. You’re deliriously sleep-deprived and feel completely clueless – in constant fear that you’re going to “break the baby.” I had suffered with depression and anxiety in the past so I was ready when I felt the stinging claws of postpartum depression creep in. I had a plan in place. It wasn’t easy, but we got through it. My husband was incredible during this time. It’s not easy to be the partner of someone who is suffering, but we’d been through it before and we knew there was light at the end of the tunnel. This is a photo of Andy & I at “Bloom” an event for new mothers. It was one of my first events with Andy by myself. She was almost 4-months-old here. For years I’d been sewing garments to build my handmade wardrobe. 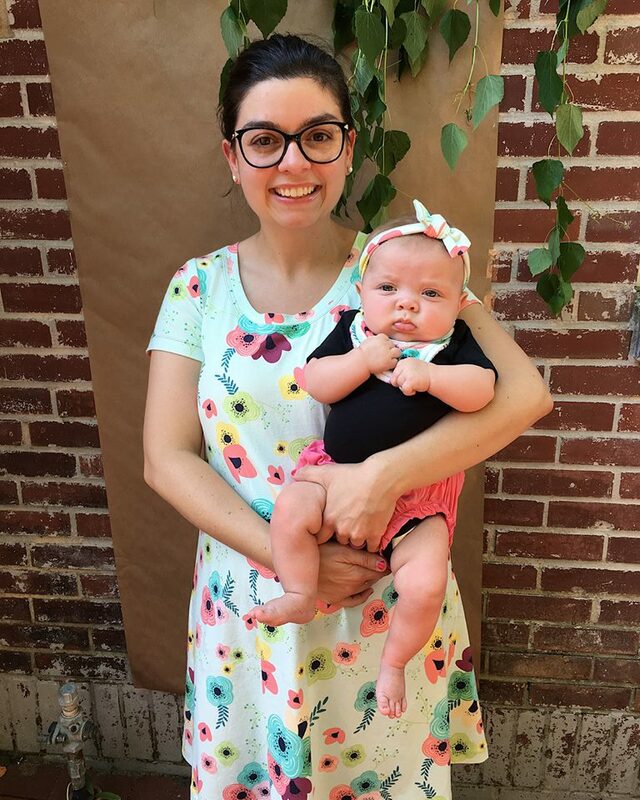 Part of me knew that pregnancy would change my body in irreversible ways, but I still found myself heartbroken to realize that most of the garments I’d made myself pre-pregnancy still did not fit months after my daughter was born. I am still working through letting these garments go. As the seasons changed and the number of handmade garments in my closet slowly decreased, I decided to lean into this discomfort. I found a tried-and-true pattern and retraced a larger size. I was in desperate need of casual clothes so I’d have something other than postpartum leggings to wear on the weekends. I finished a pair of Parkside Shorts (read about them here) that I consistently wore every.single.weekend. this summer. 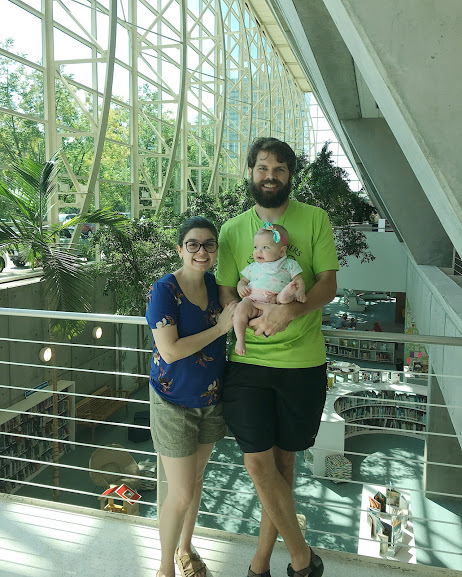 This is a photo of me, my husband and Andy at our local Library. Andy was 7-months-old here. These shorts were a GIFT to my new body. I was not going to hang on to the “I’ll fit back into these one day…” mentality. I knew I had to accept myself where I was and, for me, that meant sewing myself a garment. This is a picture of Andy & I at a local Plant Swap. I am wearing a Laundry Day dress I had just sewn for myself. I made Andy a matching bib and bow with the scraps. Andy was 5.5-months-old here. 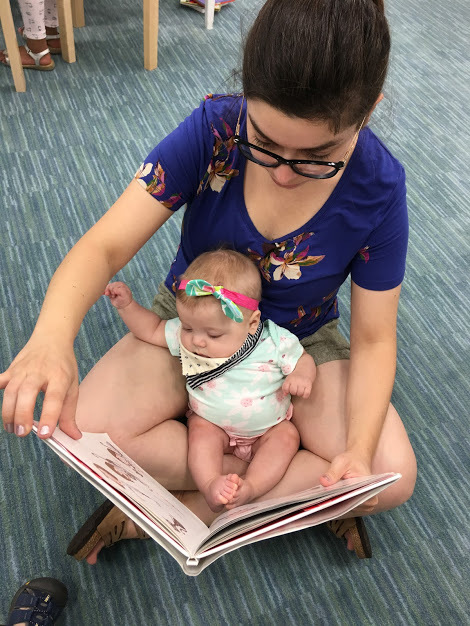 Andy & I at our local Library when she was 7-months-old. While I do think it is important to stay active (because in case you haven’t heard, kids are busy little people), I think it is even more important to accept your body where it is. Show gratitude for your body – it housed two souls for the better part of a year. That is a magnificent thing. A thing that should be celebrated. I felt this very deeply as the months passed after Andy was born. Not only is sewing garments for myself a gift to my body, it is a gift to my family. The action uplifts me and fulfills me so that I am able to be a better partner, parent, and friend. By loving myself, I can love those around me even deeper. Jordan is a self-taught sewist whose skills can be credited to the internet (and a few quilting classes here & there). She discovered the therapeutic benefits of sewing for craft as an adult. Along this journey she married her college sweetheart and recently became a mother. She shares her musing about motherhood, her latest sewing adventures and monthly lists of things she finds lovable at reslicedbyjordan.com.